KATAPULT TO WORK ON THE NEW NATIONAL MUSEUM OF FOOD WITH THE MUSEUM OF EAST ANGLIAN LIFE. International guest experience design agency Katapult, announce the winner of their Helping Hands Project competition 2019. 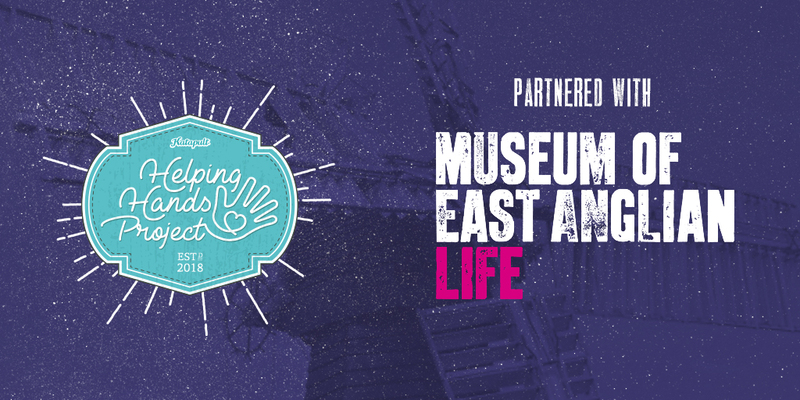 Museum of East Anglian Life has been named as Katapult’s Helping Hands Project Partners and will receive up to £10,000 in design support to help create a brand new guest experience – the National Museum of Food. Museum of East Anglian Life has committed to transforming itself into the National Museum of Food, “a museum which looks forward and back to engage the senses”. Katapult wanted to be an integral part of that transformation, helping to put guest experience at the heart of the new museum. This is the second year Katapult have run their Helping Hands Project, a charity giveaway supporting destination-based charities in the leisure, culture & tourism sectors. Choosing their charity partner for the year involved a voting process that assessed the scope of the project, positive impact and values fit. “The chance to work on creating the National Museum of Food is a real gift. Just like us, the team at the Museum of East Anglian Life want to put guest experience right at the centre of their vision. We know this will be a stand-out project that leaves a wonderful legacy for everyone involved.” – Kelly Herrick, Strategy & Development Director, Katapult. “The team was completely thrilled that we have been chosen as the Helping Hands Project winner for 2019. We are looking to create an innovative and environmentally-aware visitor experience which engages all the senses and speaks to people in a way which is directly relevant to their lives, inspiring and exciting them and leading to change in ideas and actions.” – Jenny Cousins, Director, Museum of East Anglian Life. Katapult would like to thank all the charities that nominated their projects, and encourage them to stay tuned to Katapult’s social channels for more Helping Hands Project events in the future. The Helping Hands Project was launched in December 2017, with Sir Richard Arkwright’s Cromford Mills becoming Katapult’s first charity partners in 2018. Katapult worked on a summer campaign that smashed the UNESCO World Heritage site’s targets. You can read more by visiting the case study page. Our Marketing Executive who co-ordinates with the team to ensure that we market ourselves to the best of our ability.